This magnificent jewelled crown is probably from the court of the Hassidic leader Rabbi Israel Ruzhin (1797-1850). Hassidic Judaism originated in eastern Europe in the 18th century. The small size of the crown suggests that it was made for a personal Torah scroll. Central to Jewish observance is the Torah, the first five books of the Hebrew Bible. The scroll on which the Torah is written is wound on rollers called 'Trees of Life' ('Atzei Hayyim'). It is customary to decorate the rollers with either a crown or a pair of rimmonim. The crown symbolises majesty and the law of Torah. The rimmonim evoke the bells worn on the high priest's robe as described in the Book of Exodus. This ornate ritual object is an important part of Rosalinde and Arthur Gilbert's collection. Arthur Gilbert's family, the Bernsteins, were successful Jewish immigrants, who had moved to London from Poland in the 1890s. Provenance: By tradition Rabbi Israel Freidman (1797-1850), Ruzhin, Imperial Russia (present Ukraine), and later Sadgora, Austro-Hungary (present Ukraine); thence by descent; Sotheby's, New York, 16 March 1999, lot 327. 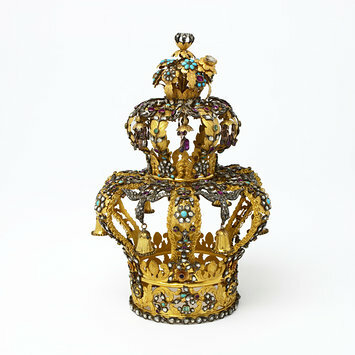 Gold and silver Torah crown, with diamonds, emeralds, rubies, amethysts, and turquoises, Vienna, ca. 1825.